It’s important to note that solar minimum is a normal part of the sunspot cycle. Sunspots have been disappearing (or nearly so) every ~11 years since 1843 when German astronomer Samuel Heinrich Schwabe discovered the periodic nature of the solar activity. Sometimes they go away for decades, as happened during the Maunder Minimum of the 17th century. We’ve seen it all before. Or have we….? Researchers are keeping a wary eye on the sun now because of what happened the last time sunspots disappeared. The solar minimum of 2008-2009 was unusually deep. The sun set Space Age records for low sunspot number, weak solar wind, and depressed solar irradiance. 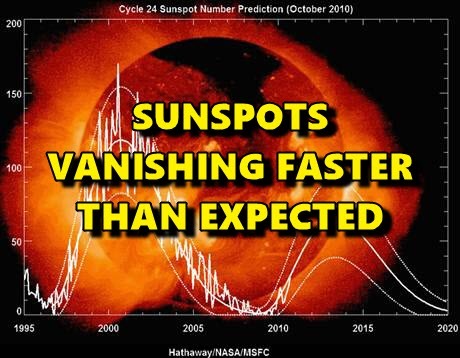 When the sun finally woke up a few years later, it seemed to have “solar minimum hangover.” The bounce-back Solar Max of 2012-2015 was the weakest solar maximum of the Space Age, prompting some to wonder if solar activity is entering a phase of sustained quiet. The faster-than-expected decline of the sunspot cycle now may support that idea. Newcomers to the field are often surprised to learn that a lot happens during solar minimum: The sun dims, albeit slightly. NASA recently launched a new sensor (TSIS-1) to the International Space Station to monitor this effect. With less extreme UV radiation coming from the sun, Earth’s upper atmosphere cools and shrinks. This allows space junk to accumulate in low Earth orbit. The most important change, however, may be the increase in cosmic rays. Flagging solar wind pressure during solar minimum allows cosmic rays from deep space to penetrate the inner solar system. Right now, space weather balloons and NASA spacecraft are measuring an uptick in radiation due to this effect. Cosmic rays may alter the chemistry of Earth’s upper atmosphere, trigger lightning, and seed clouds. Air travellers are affected, too. It is well known that cosmic rays penetrate airplanes. Passengers on long commercial flights receive doses similar to dental X-rays during a single trip, while pilots have been classified as occupational radiation workers by the International Commission on Radiological Protection (ICRP). Ongoing measurements by Spaceweather.com and Earth to Sky Calculus show that dose rates at cruising altitudes of 35,000 feet are currently ~40 times greater than on the ground below, values which could increase as the solar cycle wanes.